ntel, Nigeria’s advanced 4G/LTE network operator has announced an exciting pre-launch opportunity to early pre-subscribers as it prepares to enter the market. ntel has disclosed that the first batch of subscribers to reserve their numbers on the network, and subsequently SIM-activate after launch, will be recognized as Pioneers on the network. As pioneers, they will be marked out as among the first to reap the company’s promise of abundant broadband on its pure-play Advanced 4G/LTE network. Kamar Abass, CEO of ntel, said: “ntel is a proudly Nigerian company that is fully committed to empowering Nigerians through a technologically advanced pure-play 4G/LTE network. The number reservation campaign, which opened on 08/03/16 and will run until 08/04/16. 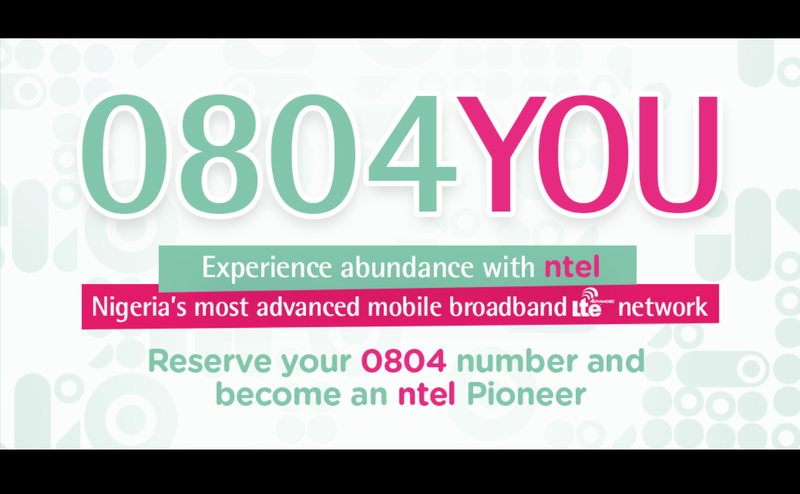 Prospective subscribers who log on to ntel’s website www.ntel.com.ng, will have the opportunity to pick and reserve up to 5 numbers of their choice. The company, which made its first Voice over LTE call in Lagos on Thursday, February 25, 2016, is positioned to lead the way as Nigeria’s most Advanced 4G/LTE network at a critical moment of transition. ntel is entering a vibrant and exciting market with four established players. The company will hope to make a mark quickly with its full commercial launch of high-definition voice, video and high-speed Internet Access services over Advanced 4G/LTE. ntel’s network is built on the 900/1800 Mhz which is recognized as the most widely used frequencies for the deployment of 4G/LTE technology.